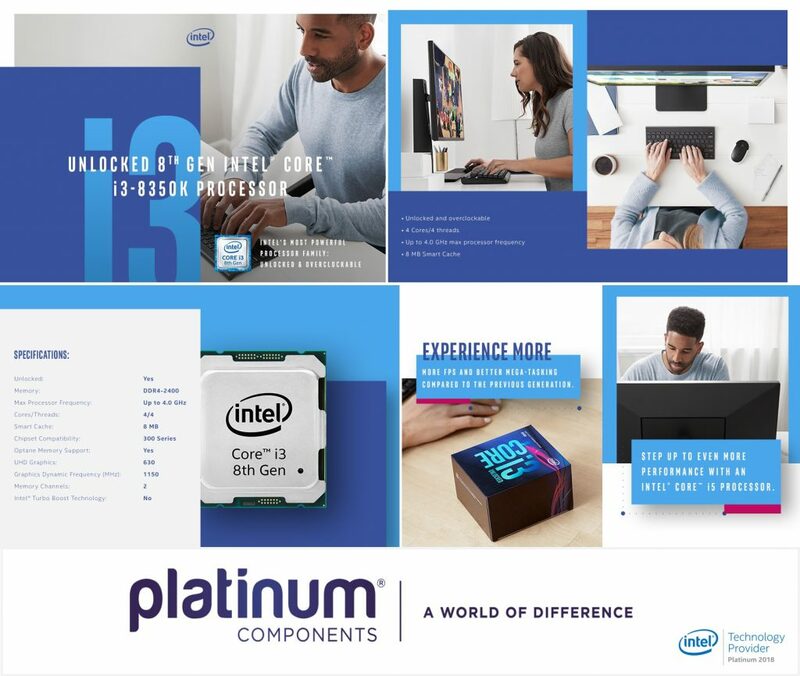 Platinum Components » News, Slider, Uncategorized » Intel I3-8100 short… No problem I3-8350k in stock! Do you have committed builds or forecasts using Intel I3-8100 & I3-7100 but can’t get stock? Need a solution quick to avoid any production penalties? We have you covered.. In stock I3-8350k! A simple upgrade so your clients wont be complaining about performance, from 3.6Ghz to 4.0Ghz, Graphic Max dynamic frequency is up to 1.15Ghz from 1.10Ghz apart from that a simple upgrade on the cooler to 130w solution and you are good to go! Contact Platinum today for stock availability, global shipping rates and of course pricing.